Amy Dellinger believes that the most important part of any real estate transaction is the people. Whether buyers or sellers, her greatest concern is helping those involved reach their goal of finding a new home and/or selling their current home. She is committed to her clients and strives to make their real estate experience pleasing and seamless. With her Senior Real Estate Specialist designation, she is better prepared to assist seniors in making wise decisions related to their housing needs. A GREEN designation provides knowledge in using the best green practices in housing. A graduate of Lebanon Valley College with a B.A. in English, Amy taught middle school English for 20 years prior to beginning her career in real estate. She is actively involved in her church and with the Kiwanis Club of the Palmyra Area. Amy served as the President of the Lebanon County Association of Realtors in 2012 following a six year tenure on the board. In 2013 and 2007 she was named Realtor of the Year by the Lebanon County Association of Realtors. Amy has returned to the LCAR board as a director. In addition, she serves on the Annville Township Architectural Review Board. Amy and her husband Wes are members of the Dellinger Real Estate Group at Brownstone where they partner with daughter, Courtney Zechman. Amy and Wes also have a son and four grandchildren. When out of the office, Amy enjoys spending time with her family, kayaking, reading and spending time in Bethany Beach, DE. Courtney is delighted to be a part of the “family business” and partnering with her parents, Wes and Amy Dellinger, as part of the Dellinger Real Estate Group. A lifelong resident of Central Pennsylvania, Courtney is a graduate of Palmyra Area High School and she holds a degree in English communications from Lebanon Valley College. While she is available to help with both listing or purchasing a home, Courtney specifically enjoys assisting clients in finding a space to spend their lives, raise their families, celebrate holidays, and make memories. She recognizes that your home is likely your biggest investment and doesn’t take lightly the task of helping you purchase or sell. Courtney and her husband, Nathan reside in Palmyra and have two daughters, Adele and Fiona. Their family enjoys spending time outdoors, hiking and kayaking, traveling and enjoying all the great family activities that our local area has to offer! Wes Dellinger earned a BS in Business Administration from Lebanon Valley College in 1975 and has served the college on their Board of Trustees since 1988. In May of 2012, he was elected chairman of the Board of Trustees of the college. In 2017, he was elected to the Bright MLS Board of Directors. Wes has been involved in sales and sales management for over forty years, the last twenty-five in real estate sales and marketing. 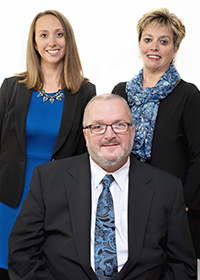 A top sales agent throughout his professional career, Wes was a consistent honoree in both the Lebanon County Association of Realtors Winner’s Circle and the Greater Harrisburg Association of Realtors Winner’s Circle. A listing representative for numerous new home communities in both Lebanon and Dauphin Counties, he is experienced in all aspects of residential and commercial sales and has worked closely with builders, developers, homebuyers and sellers. In November of 2005, Wes assumed the position of Director of Lebanon Operations at Brownstone Real Estate’s Lebanon office and has since obtained his associate broker’s license. Dedicated to the growth and success of the company, Wes continues to excel in his position, expertly creating a team environment with strong ties to the local community. The Dellinger Real Estate Group looks forward to assisting you with your real estate needs. Feel free to contact us directly through any of the sources above, or by the form below. We look forward to hearing from you!